I just came across this draft of a post from 2013 that I never published. I still like it, so here it is. Our cat still sits atop the jelly cupboard every day, perhaps with the hope of a reply from the faces in the picture…who knows really what cats are thinking? The Weekly Photo Challenge, Dialogue, prompted me to find pictures I’ve taken of our cats. 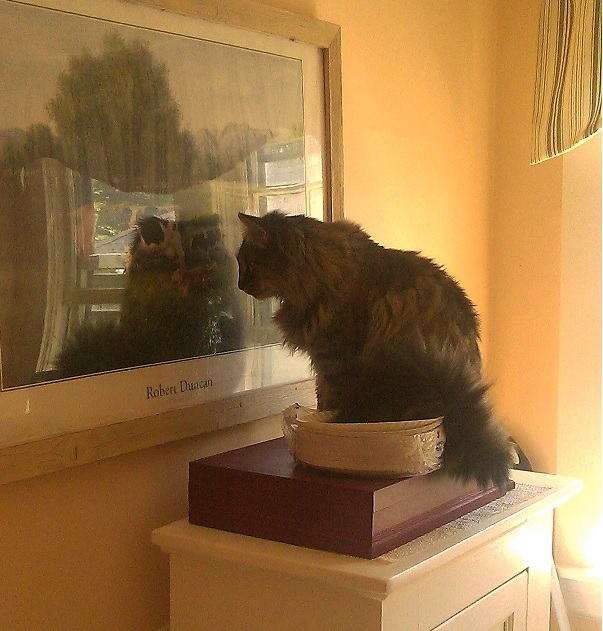 I often see Bubba, sitting on top of the jelly cupboard staring into this framed print. He does it for several minutes at a time and occasionally will make a few small meows into the reflection. I’m not sure if its the dog, the cow, or the blonde haired girl in the picture or “the other cat” he sees, that’s most interesting to him. Nothing, not even treats in the window, will tear him away from his friend in the picture!